Y’all know I’m not known for going to brand new restaurants right away. I like others to experience them early on while they’re still working out the kinks, so I can enjoy them later, once they’ve got their act together. 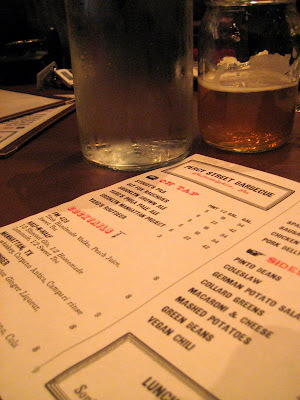 But in an effort to enjoy a nice Christopher Columbus outing, we dared visit Percy Street Barbecue during their first week of business. I was intrigued by this place due to the central texas style bbq that they promise. I went to grad school in Austin, so I ate my fair share of bbq while I was there. I don’t claim to be an expert on bbq, or let alone food, but I do have plenty of experience in this field. And the bbq options in philly aren’t all that great. There certainly aren’t texas style bbq places around here. So I was hooked. Plus, I had watched this video of their trip to bbq mecca and I was optimistic that they would really be able to pull this off. The space is pretty gorgeous and big. 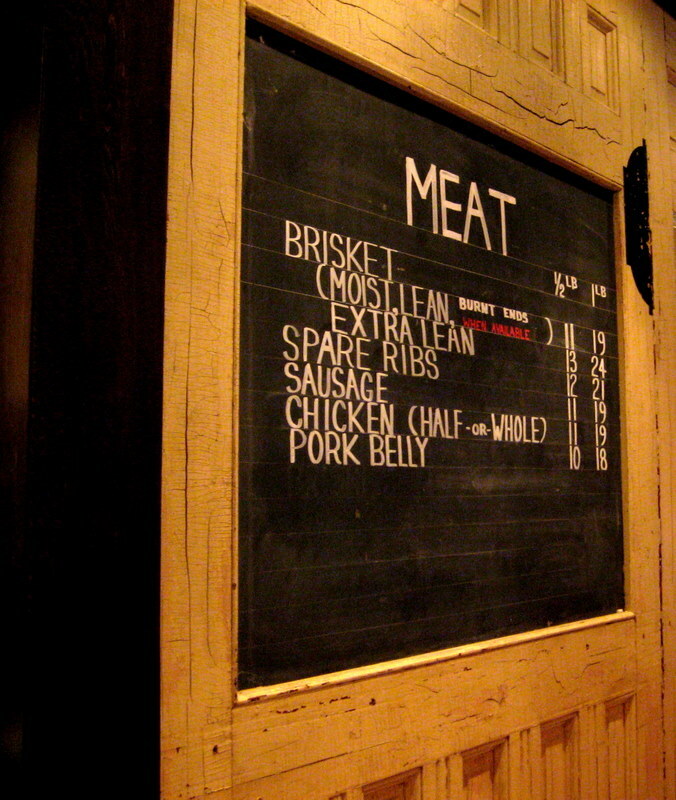 The menu is simple, and you can even see it written on these giant chalkboards by the kitchen. But this is a nice restaurant. 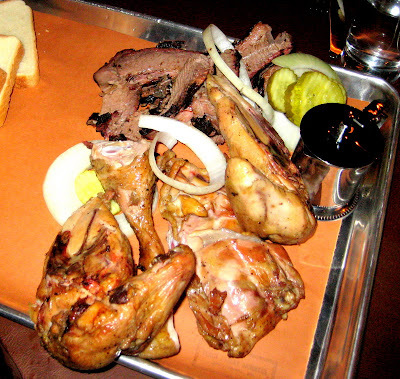 Unlike the genuine bbq joints in texas, you won’t see brown paper strewn across tables. But you will get rolls of paper towels to use as napkins. So it’s a mix of modern design aesthetic and down home grubbing. Bottles of water in vinegar bottles are set on each table and you can even get 1/2 gallons or gallons of beer. These come in big brown glass jugs. It’s a lot of beer people, a lot. Please be warned. 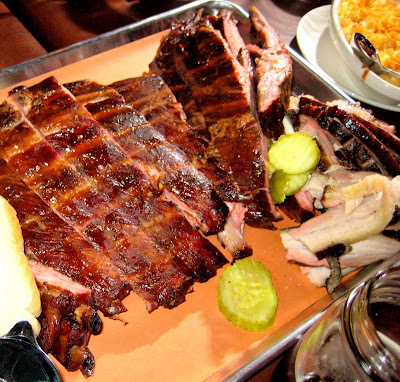 Meats are sold by the 1/2 lb and sides come small or large. The waitress recommended that for each person, 1/2 lb of meat and two small sides should suffice. We got large mashed potatoes, large german potato salad, two large mac and cheeses, small green beans, and small collard greens. Ok, so the number one gripe with this place is the paltry portions of the side dishes. Mac and cheese only comes in large, and this large is perhaps an elf’s definition of large. These are way too small, and the mac and cheese is way too good to be served this small. Please, this needs to be fixed. The mashed potatoes seemed whipped, but were not completely smooth, so you know it was made from genuine potatoes. I liked them. The large portion was a genuine large portion. The potato salad was good too, but the large wasn’t quite large. The green beans were good, and the small portion seemed right. 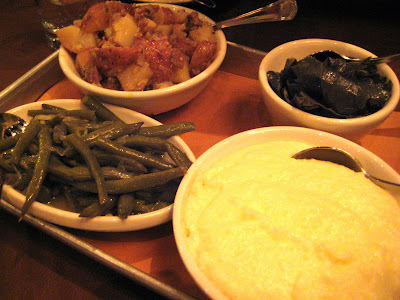 The collard greens were ok, and like the green beans, its small portion sizing seemed spot on. The collard greens could have been cooked down more and probably should be cut up into smaller pieces. It was a bit hard to maneuver the big hunks of green. Ok, onto the meats! We got everything but the sausage. Everything comes out in a tray and is served with white bread, pickles, and sliced raw onion. The accompaniments are pure central texas through and through, so I was impressed. There were 10 people in our party. We got 8 slices of bread. I’m pretty good at math but that simply does not add up. Are we supposed to cut this bread into pieces and share? Each person should get at least two pieces of bread(or more) on their own. This is how it should be done. There should be no sharing of bread. It’s white bread. I think you guys can swing it! The ribs were ok. As you can see they are pretty big, but ribs are ribs. These are not baby back ribs where the meat falls of the bone. These require work, and it was just a bit too much work for me. But they tasted fine. Now the pork belly on the other hand, the pork belly was AMAZING. Yes, so amazing that I capitalized it all. This pork belly was some of the best bbq I’ve ever had in my life, but also some of the best food I’ve ever had in my life. No joke. I could eat this day and night, despite what my arteries may have to say about it. This is the best thing on the menu here. Heed my word. Forget everything else, it’s all about the pork belly here! The brisket was ok. There are three options – moist, lean, and extra lean. We opted for the lean, but even the lean had a bit thick hunk of fat on top. The brisket was good, but it was too charred on the outside. The char is definitely not adding to the flavor. My favorite bbq in general is brisket (or at least it was until I had the pork belly here!) and whenever I’ve had it in texas, it never had char on the outside. It’s supposed to have a nice red ring around the edges due to the smoke, but there should be no char. Everyone was disappointed with the chicken. R wanted the chicken to taste like oven roasted chicken or rotisserie chicken. She also felt the chicken was dry. No one else thought the chicken was dry. In fact, we found it quite moist and juicy, but it was bland. It was so, so, so boring and bland. It had absolutely no flavor at all. We told the manager none of us liked the chicken and he was shocked. He said the chicken was his favorite thing on the menu. Egads. If plain, flavorless, bland chicken is your thing, then go for the chicken here. If not, then avoid it at all costs. But if you do get it, be sure to bring some kind of sauce for it. One other issue is the bbq sauce they have here. They only have one kind, and I assume they make it in-house, but it’s spicy. I like spice in pretty much everything, so I was fine with it. But for those that don’t like spice or can’t handle spice, be warned. This stuff has kick. And you don’t really get an option to have bbq without kick. No one wanted any dessert, except for R. She wanted the chocolate layer cake. Man, was this thing disappointing. We thought the chicken couldn’t be topped, but this sure beat it. 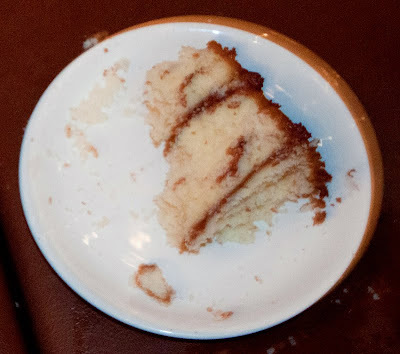 This cake was dry, dry like the freakin Sahara, and it tasted like yellow cake mix from the grocery store. And not even Duncan Hines or Betty Crocker, I’m thinking generic no-frills yellow cake mix. We passed this around and after everyone took a bite, everyone had to drink. Cakes should be moist. What a cake fail! But we did end the evening on a high note. 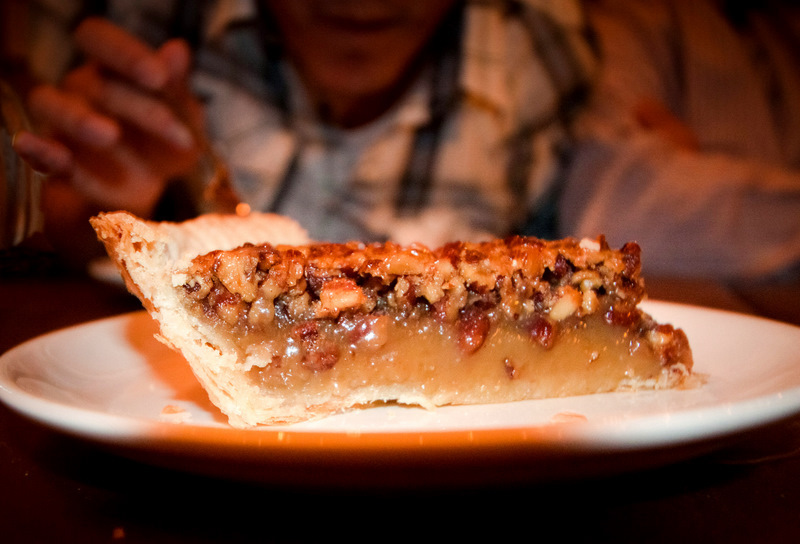 We didn’t order the pecan pie, but it showed up. I think it helped that we spent a whole crapload of money in their first week in business and that we gave them some honest constructive feedback. This pie was awesome! It wasn’t freakishly sweet like some pecan pies I’ve had before, this was just sweet enough. I wholeheartedly recommend this pie. So the service needs some work. The amount of time it took for our drinks to come out was not really acceptable. We were just sitting there wondering where our drinks were, for a very long time. This desperately needs to be improved. But the food came out pretty quick, so we were impressed with that. And the servers are nice and friendly. So basically, there were definitely hits and misses with the food here. The pork belly and the brisket are hits, as are the sides, and the pecan pie, but the portions of the sides, the chicken, and the chocolate layer cake are severe misses. But would I eat here again? Hell yeah, as I’ve been dreaming about the pork belly ever since! Is it beer 30, yet? I’m ready to crack open a nice bottle of Sierra Nevada Celebration Ale! What a fun day you had! Your pictures are ralely cool, Lily’s headband it’s ralely nice! She looks ralely pretty on her white dress!